Captain Francis Drake (webmaster's 7th great grandfather) nephew of Sir Francis Drake. Daughter Catherine Elizabeth married Hugh O'Dunn in Piscataway, NH. Their great-great granddaughter, Elizabeth Dunn, (webmaster's 2nd great grandmother ) married Joseph Jackson Burson of Wilcox county, Alabama. "Nicholas le Drake dead by 1303 = Agnes, described as widow of Nicholas le Drake in 1303/4. (Alive) 1304,1319"
land (hold of) the manor. In a later manor survey described as a (Molman) and holding Graunger's land, (Blache's) land and Simon Geoffrey's land. (Taxed (?) in the subsidy of 13(27)"
Waltham. (Dead?) on the 1419/20 (holding) (9) acres of (free?) land of the manor by (?) and customary land at (Eldefeldes)"
after her death to son William" = "Joan, mentioned in the court rolls from (1423) onwards. Died in (1481?)" Eldefeldes and Graungers on his mother's death. Died in (1510) (having held certain free and bond tenemants) of the manor"
at the Subsidy. (Dead) on (1542)" = "Agnes, widow of William Butler. Married 2ndly before 1515"
surrender of 154(4) 1545 admitted to (Grangerscroft?) surrendered by brother Thomas"
this is the last of the direct descendants on this chart. 1. NICHOLAS1 DRAKE was born in Great Waltham, Essex, England, and died Bef. June 14, 1302. He married AGNES. 2. i. NICHOLAS2 DRAKE, b. Abt. 1275, Great Waltham, Essex, England; d. Abt. 1331. 2. NICHOLAS2 DRAKE (NICHOLAS1) was born Abt. 1275 in Great Waltham, Essex, England, and died Abt. 1331. He married JULIANNA. 3. i. ROBERT3 DRAKE, b. Abt. 1310, Great Waltham, Essex, England; d. Abt. 1392. 3. ROBERT3 DRAKE (NICHOLAS2, NICHOLAS1) was born Abt. 1310 in Great Waltham, Essex, England, and died Abt. 1392. He married ELLEN. 4. i. WILLIAM4 DRAKE, b. Abt. 1342, Great Waltham, Essex, England; d. Bef. May 02, 1420. 4. WILLIAM4 DRAKE (ROBERT3, NICHOLAS2, NICHOLAS1) was born Abt. 1342 in Great Waltham, Essex, England, and died Bef. May 02, 1420. 5. i. EDMUND5 DRAKE, b. 1403, Great Waltham, Essex, England; d. Bef. October 17, 1471. 5. EDMUND5 DRAKE (WILLIAM4, ROBERT3, NICHOLAS2, NICHOLAS1) was born 1403 in Great Waltham, Essex, England, and died Bef. October 17, 1471. He married JOAN. 6. i. WILLIAM6 DRAKE, b. Abt. 1440, Great Waltham, Essex, England; d. Bef. December 19, 1510. 6. WILLIAM6 DRAKE (EDMUND5, WILLIAM4, ROBERT3, NICHOLAS2, NICHOLAS1) was born Abt. 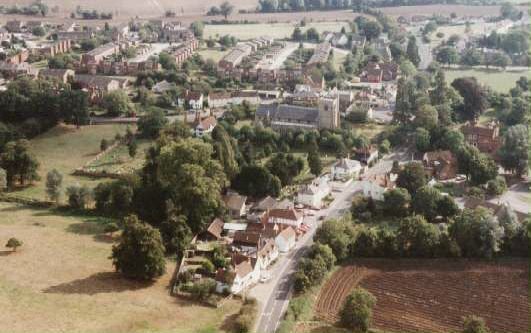 1440 in Great Waltham, Essex, England, and died Bef. December 19, 1510. 7. i. THOMAS7 DRAKE, b. May 29, 1465, Great Waltham, Essex, England; d. November 27, 1541, Slamsley, White Notley, England. 7. THOMAS7 DRAKE (WILLIAM6, EDMUND5, WILLIAM4, ROBERT3, NICHOLAS2, NICHOLAS1) was born May 29, 1465 in Great Waltham, Essex, England, and died November 27, 1541 in Slamsley, White Notley, England. 8. i. WILLIAM8 DRAKE, b. Bef. June 1518, Great Waltham, Essex, England; d. August 23, 1555, White Notley, Essex, England. 8. WILLIAM8 DRAKE (THOMAS7, WILLIAM6, EDMUND5, WILLIAM4, ROBERT3, NICHOLAS2, NICHOLAS1) was born Bef. June 1518 in Great Waltham, Essex, England, and died August 23, 1555 in White Notley, Essex, England. He married AGNES BUTLER. 9. i. WILLIAM9 DRAKE, b. Abt. 1553, White Notley, Essex, England; d. November 03, 1616, Elmstead, Essex County, England. 9. WILLIAM9 DRAKE (WILLIAM8, THOMAS7, WILLIAM6, EDMUND5, WILLIAM4, ROBERT3, NICHOLAS2, NICHOLAS1) was born Abt. 1553 in White Notley, Essex, England, and died November 03, 1616 in Elmstead, Essex County, England. He married JANE MERRYLLS. 10. i. ROBERT10 DRAKE, b. July 03, 1581, Halford, Essex, England; d. January 20, 1667/68, Hampton, Rockingham County, New Hampshire. 10. ROBERT10 DRAKE (WILLIAM9, WILLIAM8, THOMAS7, WILLIAM6, EDMUND5, WILLIAM4, ROBERT3, NICHOLAS2, NICHOLAS1) was born July 03, 1581 in Halford, Essex, England, and died January 20, 1667/68 in Hampton, Rockingham County, New Hampshire. He married JANE GAWTON. i. CAPT. FRANCIS11 DRAKE, b. 1625, Colchester, Essex County, England; d. September 24, 1687, Middlesex County, New Jersey; m. MARY WALKER, 1650, Portsmouth, N. H..
1 Notes from Barbara Denahey: The earliest Drake ancestor identified is Captain Francis D r a k e. He was born about 1618 probably in Devonshire,England. He apparently immigrated to Portsmouth,NewHampshire by 1635. He later lived in Piscataway, New Jersey. His will was dated 2 9 S e p 1667 and was recorded in Middlesex County, New Jersey. He married Mary Walker.